So lately I am fascinated by the rock painting phenomenon currently sweeping across the United States. It started, I believe, with The Kindness Rocks Project and has evolved. There are "rock clubs" and "rock groups" peppering the nation and most have Facebook Pages. Painted rocks can be found coast to coast in every town, city, burb, and all the rural areas in between. Literally, they are everywhere. 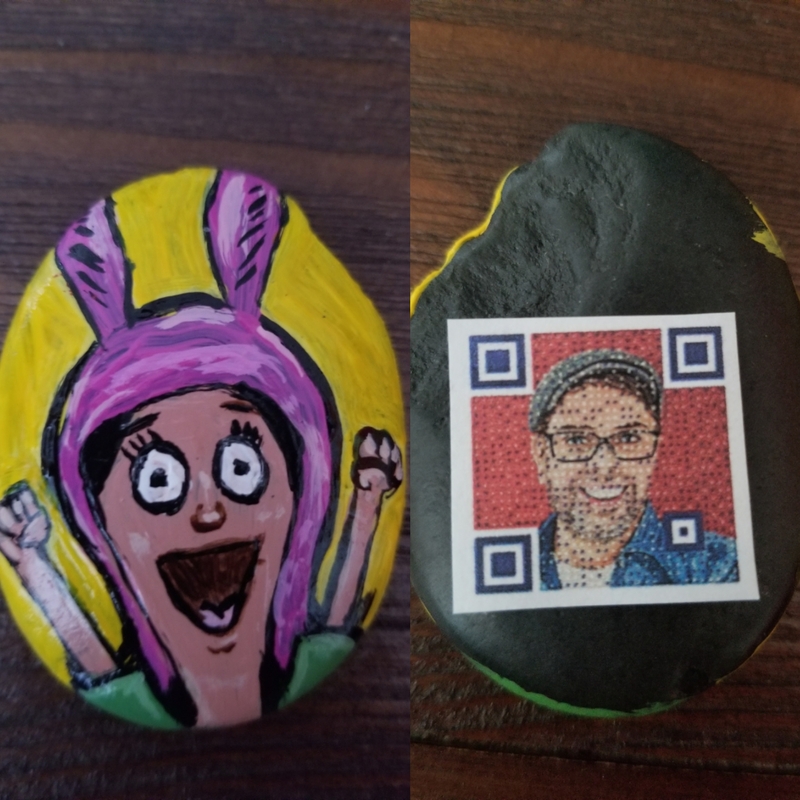 The next time you are out on the town for dinner or are going to the local grocery store, keep your eyes out for a colorful rock. If you need inspiration join one of the many, many facebook groups for rock painting enthusiasts. I am sure your local town has one, if not, be the person that starts one. 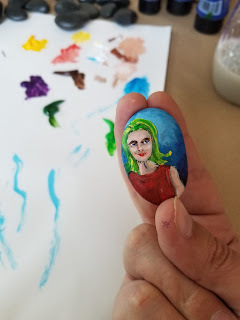 Painting rocks is a simple, creative outlet that can be loads of fun for church groups, senior living art projects, boy/girl scouts, teachers, or just anyone with a creative spirit. 1. Rocks - I bought mine at the Dollar Tree. 2. Acrylic Paint - I already had some in my studio but you can buy at your local craft store. 3. Sealant - I use a spray polyurethane sealer some use Mod Podge. This was my first batch. I finished just three my first day and hid them the next day all around downtown. I took pictures of the hidden rocks and posted vague clues to the local rock group @naparocks on Facebook. One of the three resurfaced. The "Rick and Morty". One of the three was found by someone that read the back and played the game (followed instructions). That's 33% which is a good return in what essentially can be looked at as a marketing scenario (it's what I do). I was excited! I glued the paper to the back of each rock and sealed it over. 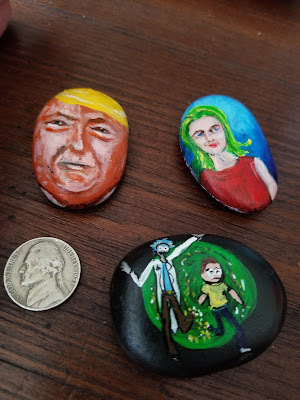 The rocks I paint are small. I like it that way. I decided I needed a way to sign them. Make them uniquely mine. 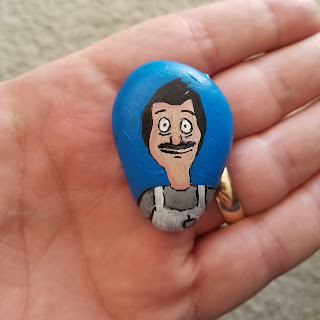 I settled on something similar to what I was already doing by gluing Napa Rocks Facebook Group info to the back of all my rocks. I decided on taking that concept one step further and created a custom QR Code Self Portrait. If you like my rocks, maybe you'll like my artwork. I am still having an absolute blast creating, hiding, finding, and re-hiding little art rocks while at the same time, giving a larger audience access to my artwork. I don't currently see an end in sight to my rock painting fun! So be on the look out around Napa. Please post a pic or tag me on facebook or comment on this blog if you find one of my rocks. Thanks!! I plan on changing up the theme each batch. This first batch is "prime-time cartoon" themed. I am anxious to see how many, if any, get posted. How many, if any, get kept, re-hid, etc. 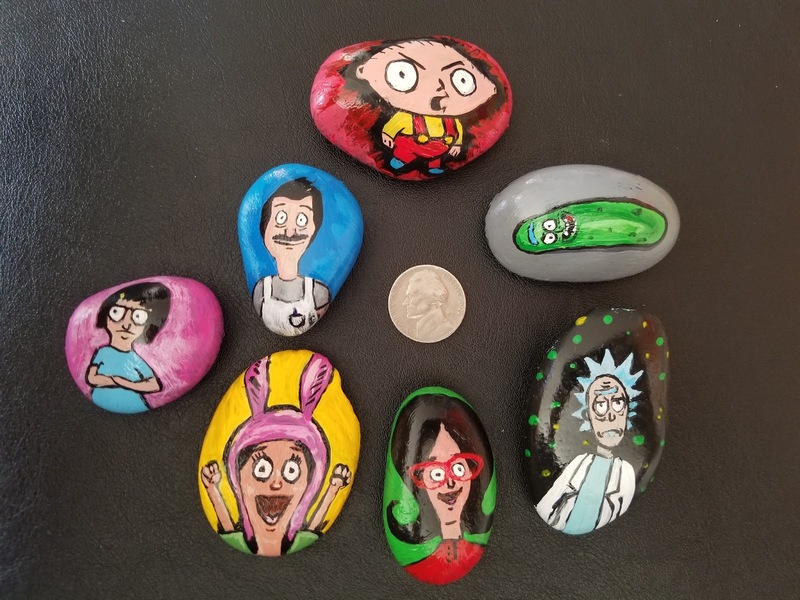 An overwhelming amount of requests to purchase my rocks have led me to give in to the pressure and add them to my online art gallery for purchase. I still make them and hide them for free all over town but will honor request to purchase them from this website.